Thank you, Jacob Keltner, for your years of service to and for your community. You are missed and loved. My prayers and condolences are with your family, community, friends and the Police Department. May God Bless ALL our men and women in blue. I pray you receive of HIS awards. Thank you. 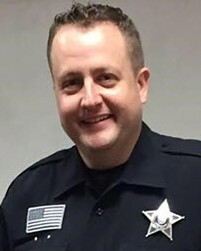 To the family of Deputy Sheriff Jacob Howard Keltner, friends, and the McHenry County Sheriff's Office, Illinois. Thank you Deputy Keltner for your dedication and for paying the ultimate sacrifice for the fine folks in the great state of Illinois. You are a true American HERO !!!! My thoughts and prayers are with your family, friends and co-workers. My you forever, rest in peace, my brother. Please extend my heartfelt condolences to the family and friends of Deputy Sheriff Jacob Keltner on their tragic loss. May our Lord provide them with the needed strength and comfort during this difficult time. Thank you for your service Deputy Sheriff Jacob Keltner, and rest in peace brother in blue. R.I.P. Dep. Keltner, we have the watch. God Bless, you are a true HERO! My prayers to you and all those around you. I do not personally know you, but I am in pain. Rest in Peace My Brother. Rest In Peace Brother Blue. “Blessed are the Peacemakers for they shall be Called Sons of God! Rest in Peace Deputy Keltner. Thank you for your service. My thoughts and Prayers go out to your family, coworkers and friends. Rest in peace Brother Daniel, you are a true American Hero and will never be forgotten for your service and courage. On behalf of the Klamath County Sheriff's Office in Klamath Falls Oregon, we send our sincerest sympathy in the recent loss of your Deputy, Jacob Howard Keltner, in line of duty. It is always a huge loss when a fellow deputy makes the ultimate sacrifice. His bravery and courage to protect and serve your community has not gone unnoticed. Your sacrifice was far too great. Your family is in our prayers. A police officer should be remembered not by how he died, but how he lived! A great man has gone to secure a safe path for the rest of us to follow. Thank you to you, your family and the McHenry County Sheriff's Office. Our country is a little less safe without you. Rest in Peace Brother! Rest in Peace Deputy. You are lost and will never be forgotten. Thank you for your service, it is now time for you to patrol around in Heaven. My deepest sympathies and condolences to the family of Deputy Keltner. May his soul forever rest peacefully in Heaven, and may God truly bless his family with his loving peace. I am sorry for your loss. McHenry Country a place I’ve spent so much of my life with family ties. Love to your family and friends. God speed! Prayers have been sent for Deputy Keltner. May he rest in peace and may God ease his family, friends and agency's mourning! Heartfelt respect for this brother in arms. Condolences to his family and fellow officers.